The tissue culture facilities of a modern biological science laboratory can easily be distinguished from the rest of the lab by their extreme cleanliness and, relatively speaking, tidiness. Notices abound, exhorting users to put stuff away properly, chuck out old bottles of solutions, soak glassware in the correct buckets, and dispose of plastics in the special bins labeled “autoclave waste.” All of these measures, unusual in the cheerful anarchy of most labs, are designed to ward off the dreaded twin spectres haunting all tissue culture work: that the cells die because they haven’t been looked after properly, or that somebody (never the cells’ owner, naturally) contaminates the precious cultures with bacteria or fungus. Such calamities at best cause a few days’ labour to be consigned to the bin, but sometimes, months of painstaking work are destroyed in a few moments of carelessly insanitary behaviour. Have you been making bread at the weekend? Then don’t go near your cells, or your baking yeast will mysteriously manage to breach all of the defensive barriers and get into your cultures. As befits a black art, tissue culture is surrounded by rituals evolved to ward off death and disaster. Doing tissue culture requires a mixture of skill, concentration, and willingness to spend extremely long hours doing mindless repetitive tasks. Upon entering the tissue culture lab, the modern acolyte puts on a specially designated lab coat and luridly coloured latex gloves, and gets out the chilled cell growth medium from the fridge to warm up in a water bath set to blood temperature. The names of the tissue culture media contain their history: Dulbecco’s Modified Eagle’s Medium; Roswell Park Memorial Institute Medium; Ham’s Nutrient Mixture—all were developed by trial and much error and contain a witches’ brew of chemicals that, when mixed with serum derived from the blood of cows, chickens, and other farm animals, will nurture the precious cells. Bottles of medium are jealously guarded, sometimes to the point of being labeled in a paranoid personal code, and are never used for multiple cell types, to prevent cross-contamination. Woe betide the lab worker caught infringing this rule by their boss, who has a folk memory of the terrible period when practically every cell line turned out to have been contaminated with the weed-like HeLa cells. The growing cells are taken from their temperature-controlled incubator, bringing with them the tantalisingly fizzy whiff of CO2-laden air, and looked at under the microscope, to see whether they are “ready to split”; whether they are starting to outgrow their flask. If they are, one of the big tissue culture hoods is fired up. The air flow is switched on, and the fans rumble into life, providing a barrier of constantly rushing air between the user and the enclosed work surface. Then the front panel is removed, and the inside of the hood is thoroughly swabbed with alcohol, together with all of the bottles of medium and miscellaneous bits of equipment. In former days, enthusiastic workers would set the alcohol on fire “just to make sure” that everything was truly sterile, although the side effect of sometimes setting fire to one’s alcohol-soaked hands (gloves are a modern innovation) in a spectacular but (mostly) painless way may have been a more likely enticement. The work begins. Endless flasks are brought to the hood, and the cells inside are laboriously removed and counted under the microscope. Then, they are divided up into new flasks pre-filled with growth medium and returned to the warmth and darkness of their incubators. Once the mundane husbandry is finished, there are likely to be experiments to tend to as well. Reagents are added to cells, medium is changed or augmented, and cells are harvested and go off to be analysed back in the real world of the main lab. Hours and hours of time can be spent in tissue culture, often to the accompaniment of appalling rock music, mercifully piped straight into the ear nowadays, but formerly blasted out on boom boxes to willing and unwilling listeners. Conflicts between the Radio 3 cricket commentary brigade and the lovers of The Smiths and the Stones were legion before Mr. Sony came to their rescue. And in the background, the fans driving the airflow of the hoods provide a steady rumbling ostinato. Despite all of the precautions and the hours spent cosseting the cells, everyone who has spent any time at all doing tissue culture knows that the one given is that cells die; some quickly, some slowly, some by infection, some by rough treatment, some by voodoo, but they die. Paradoxically, cancer cells are generally much better at dying off in tissue culture than fresh cells derived from normal tissue. Dying cells are a nuisance, because you can’t do any experiments with dead cells, and they are a mark of scientific incompetence—you must have forgotten something and are therefore a science numpty. Why this lengthy preamble? Because, in the face of all of the cumulative tissue culture lore, the mountains of dead cells, and the wasted years of scientific time, in one laboratory at the Imperial Cancer Research Fund, someone finally started to wonder whether all of this death might be trying to tell us something biologically meaningful. Was it possible that cell death was not just an awkward obstacle to doing decent experiments, but might matter? Furthermore, might finding the reason for all of the cell death lead to the answer to an enduring problem with our understanding of cancer: why is it that cancer, a disease of madly proliferating cells, is not more common? Today, Gerard Evan is a major force in cancer research, but in the mid-1980s, he was a distinctly worried junior faculty member in the Ludwig Institute of Cancer Research in Cambridge. Gerard’s career up to then had had the standard upward trajectory of a smart Oxbridge-trained scientist: a PhD at the Medical Research Council (MRC) Laboratory of Molecular Biology in Cambridge, followed by a very successful postdoc in future Nobel laureate Mike Bishop’s lab in San Francisco, and then a return to Cambridge in the early 1980s to run his own lab as a tenure-track group leader, the lowest rung on the lab head career ladder. Gerard is a very appealing character; a curly-headed, eminently cuddly man, his quicksilver mind is overlaid with a mixture of charm and irrepressible enthusiasm, rendered bearable for those of a more Eeyore-ish disposition by an undercurrent of self-doubt and angst. His hunger for facts of any kind means that his brain is stuffed with information, both trivial and less so, which makes him an entertaining companion despite his appalling taste in jokes. He is ridiculously easy to tease; friends have a wide choice of strange enthusiasms to pick from: a shady past as a member of the Comberton Morris Men; an unwholesome addiction to Rohan multi-zip trousers; his unswerving dedication to being an early adopter of any and every piece of electronic gadgetry—the list is endless. 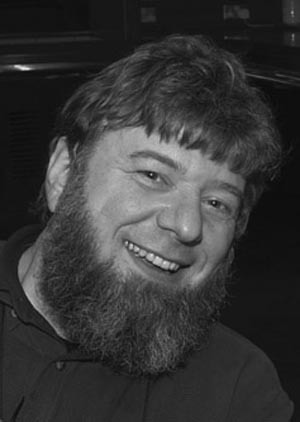 Scientifically, he possesses in spades the gift of being able to integrate information from diverse sources and apply it to his own work, giving him the ability to view data from multiple perspectives; he always sees the wood despite the trees, an invaluable asset when hacking one’s way through the murky data forests encountered in biology. Like many nascent lab heads, Gerard had a dowry from his ex-boss comprising unfinished postdoctoral projects, and he simply continued to work on them. He was allotted a minute amount of lab space in the Ludwig Institute and hired a young research assistant, Dave Hancock, who’d previously been working across the road in the Department of Pathology and Virology but fancied a change. Dave was soon joined part-time by Trevor Littlewood, who was actually the laboratory manager for the Ludwig Institute but was pining for the bench; in fact, he moved into a full-time position with Gerard shortly afterwards, leaving the world of laboratory administration behind forever. Trevor and Dave are pivotal to the story of Gerard Evan. Both very good at lab work, both good humoured, tolerant, well adjusted, and equipped with very English senses of humour, they provided a foil for their hyperactive boss; nobody could have asked for a better start to their lab than having Trevor and Dave around. The three of them produced some sound but not particularly inspiring work on MYC, exploiting the monoclonal antibodies that Gerard had made in the Bishop lab. The recent development of monoclonals meant that there was a lot of low-hanging experimental fruit to be picked for those in the know; monoclonals were extremely precise tools for tracking where in the cell a protein was and whether it was appearing and disappearing in some coordinated way or staying around for the whole of a cell’s life. Early on, in 1985, Dave and Gerard hit the high spot by publishing a paper in Cell showing where in the nucleus of a cell the MYC protein lived. The lab’s publication output over the next couple of years was good, but not mind-blowingly so, and Gerard’s growing feeling that, scientifically, he was drifting without purpose, was compounded by his disappointment with the Ludwig Institute, which was not proving to be the vibrant and well-connected place that he had hoped it would be. In 1987, therefore, he started looking around elsewhere for jobs. The ICRF was advertising for junior tenure-track group leaders, the same career rung that Gerard was currently on, and he applied for and was offered a job there. However, his bosses at the Ludwig Institute conducted a charm offensive to persuade him to stay put, and in the end he turned down the offer from London. In retrospect, it is somewhat incomprehensible that the Ludwig wanted to keep him, because shortly afterwards, they announced the closure of their Cambridge laboratories, with the concomitant redundancy of all its employees. This was a calamity for many of those there and a period in his life that Gerard still recalls with much pain. After the initial shock had subsided, the Evan lab decided that they should if at all possible ride out the storm together, trying to move en masse elsewhere, and Gerard called Walter Bodmer, the ICRF Director, to learn whether there were any jobs still on offer. Walter, whose sometimes alarming demeanour is widely held to conceal a kind heart, not to mention an impeccably good nose for scientific excellence, not only encouraged Gerard to move, but offered him a permanent tenured position at Dominion House, an ICRF outpost over by Bart’s Hospital. 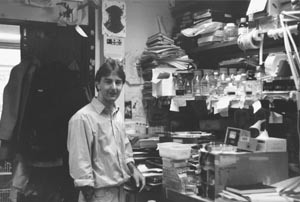 Despite reservations about the lengthy (more than two-hour) commute that would be required (family constraints meant that none of the Evan lab members, including Gerard, could relocate to London), Gerard accepted the job, and in 1988, the lab moved. 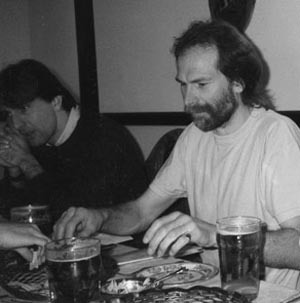 Dave Hancock and Trevor Littlewood, Evan laboratory dinner, 1980s. The Dominion House laboratories had opened in 1983, as part of Bodmer’s drive to expand the ICRF’s links with clinically relevant cancer research. Under the initial leadership of John Wyke, they were small, comprising just four labs, and from the outset, suffered from being a rather isolated satellite of the main laboratories in Lincoln’s Inn Fields, without the focus that was to make Clare Hall so successful. By 1988, John Wyke had moved on to become Director of the Beatson Institute in Glasgow, and the Dominion House lab heads comprised Mike Owen, an immunologist, and Gordon Peters and Roger Watson, both interested in the molecular biology of oncogenes. Life there was a bit quiet, with occasional excursions to Lincoln’s Inn Fields, a half-hour walk away, being the only excitement; thus, the arrival of the Evan lab was a major social and scientific improvement. Because science is rather incestuous, Gerard and his three new colleagues already knew and liked each other pretty well. Having Gerard bouncing about the corridors galvanised the place, and the Evan laboratory also had a sense of a new beginning. Gerard’s work up to then had been focused on the biochemistry of MYC: finding out where the protein was located, when it was made, when it was degraded—the nuts and bolts of a protein’s life. However, the move down to London precipitated a change in focus, towards a far more biological emphasis. It was all very well knowing when and where a protein lived and worked, so to speak, but that told one very little about what it did, which in the end is what matters in biology. The scientific environment at the ICRF was fertile ground for Gerard’s shift in thinking; as well as his new Dominion House colleagues, he had a close scientific friend in the ICRF main laboratories: Hucky (Hartmut) Land, an eccentric bear of a man with an uncanny resemblance to an extremely large garden gnome. Hucky had done a postdoc in Boston with the rather shorter Bob Weinberg, who, somewhat paradoxically given his size, is one of the giants of the oncogene field. Together with Luis Parada, Land and Weinberg, as related by Bob Kamen in Chapter 2, had published an extremely important paper in Nature in 1983, showing that for the oncogene RAS to turn normal cells into tumour cells, it required a second oncogene to help it; in other words, oncogenes had to cooperate with each other to cause cancer. Parada, Land, and Weinberg suggested that each of the oncogenic partners brought a separate oncogenic attribute to the relationship, and only when these were added together could the normal cellular controls be overridden, allowing the formation of a cancer. Hucky had been recruited as an ICRF lab head in 1985, and his lab had continued to work on oncogene cooperation, with a strong interest in what MYC and RAS were able to do together. All of the Land lab’s work was based on tissue culture, and in order to get the genes in which they were interested into the cells in which they wanted to study them, they had developed a range of retroviral vectors, the pBABE series, which were so useful that they are still widely available today, 25 years later. To put a gene into a cell, one inserted its DNA into a suitable pBABE vector, packaged the naked vector DNA up in a protein and lipid coat to make it look like a retrovirus, and then infected the cells of interest, selecting the ones that had taken up the pBABE invader by treating them with an antibiotic. The protein antidote to the antibiotic was encoded by a gene in the pBABE vector DNA, so that cells without pBABE died from the antibiotic treatment, and those carrying pBABE lived and grew, becoming so-called stable cell lines permanently expressing the foreign gene of interest. pBABE vectors made it possible to make hundreds of stable cell lines, and some of those in Hucky’s lab contained an introduced MYC oncogene, which piqued Gerard’s interest. The world of molecular biology at that time was still in a state of great excitement about the cell cycle, following Lee and Nurse’s 1987 publication showing that the cell cycle control mechanisms were pretty much universal in eukaryotic organisms. Legions of postdocs and graduate students were occupied worldwide in working out how their protein of interest could be bolted onto the cell cycle: Did it regulate the cycle? Did it help cells get into cycle? Did it stop them getting out of cycle? Did cells cycle faster in its presence, and so on, and so on. Naturally, cancer biologists were very much part of this buzz, given the central role of cell growth in their particular obsession, and what many of them had focused on was how entry into the cell cycle was regulated. Clearly, if an oncogene could push cells into cycle when they were supposed to be resting, this was a property that could cause inappropriate growth, and maybe lead to cancer. Normally, in the body, the majority of our cells are not in cycle; this is the basis of cancer therapies that attack only actively dividing cells—most cells are untouched because they are quiescent. The resting cells only leave their quiescent state if they detect that the body is wounded or traumatized in some way. They receive these damage messages through receptors on their surfaces, which detect growth factors released from cells in response to wounding. In tissue culture, cells divide non-stop because the growth medium in which they live contains serum, derived from animal blood, which is a very rich source of the growth factors; effectively, tissue culture cells have been tricked into believing that they are permanently wounded and therefore must cycle constantly. To perform experiments mimicking the transition from quiescence to cycling in tissue culture, the trick is to starve the cells of serum, lulling them back into quiescence, a state known as G0 (G zero). Cells in G0 can then be studied as they go back into cycle to see which proteins are being made, and in what order. Many experiments in multiple laboratories had by the late 1980s established a hierarchy of genes being switched on upon entry into cycle, with the first out of the blocks being named the Immediate Early genes (followed, unsurprisingly, by the Early, then the Delayed Early genes, with the sad, one plimsoll undone and baggy-shorted Late Genes tagging along at the back). Cancer biologists were all very gratified to find that many of their favourite oncogenes, including MYC, were Immediate Early genes, strengthening the idea that oncogenes push cells into cycle. Overexpression of many of these Immediate Early oncogenes was indeed enough to get cycling to occur, and again, MYC obligingly fell into line in this respect. Using Hucky’s MYC-expressing stable cell lines, and subsequently, in cell lines they’d made themselves, the Evan lab began to look more closely at MYC’s role in the cell cycle. They soon noticed that MYC was not a typical Immediate Early gene. Most Immediate Early genes come on rapidly after serum stimulation and then switch off equally rapidly, but MYC came on fast and didn’t switch off. Instead, although the amount of MYC protein reduced, it lingered on well into subsequent stages of the cell cycle. Was MYC perhaps doing something different to regulate the cycle? Gerard and Trevor, together with a postdoc, Cathy Waters, decided to set up some experiments looking at what happened if MYC was removed at different points in the cell cycle, not just in G0. To do this, the protocol was to serum-starve control cells and matching stable cell lines carrying extra MYC for a day or so (over the weekend was a handy time), put the cells back into cycle by adding serum, and then do their assays. They got some interesting results, showing that MYC was indeed needed at a different point in the cell cycle from the rest of the Immediate Early gang, but the experiments were severely hampered by a very awkward technical problem: although the control cells without any extra MYC in them seemed to be fine without serum, the MYC-containing cells were completely unreliable, often dropping dead in such numbers that there weren’t enough to analyse at the end of the experiment. Trevor, Cathy, and Gerard were not particularly fazed by their annoying technical glitch, because the problem that they were dealing with was well known to MYC biologists. Some years earlier, Bob Kingston, a molecular biologist at Harvard, had noticed the same phenomenon, which he had labeled “sick of MYC,” and the field had been battling against it ever since. The general assumption was that MYC was such a powerful cell cycle regulator that its overexpression could throw cells into cycle in the wrong way, causing a catastrophically toxic reaction that resulted in death. Indeed, when the Evan lab’s errant cells were examined under a microscope, there were always lots of round cells floating in the medium instead of attached to the bottom of the tissue culture flask, looking a lot like cells in the process of mitosis, the final splitting into two new daughter cells. Perhaps a proportion of these cells were unable to complete the cell cycle and died? Furthermore, the tissue culture facilities at Dominion House were primitive in the extreme, prone to temperature fluctuations, contamination, and general inefficiency, and everyone knew that keeping cells alive in such conditions was a tricky task. (Indeed, in the hot summer of 1990, the lab heated up so much that the incubators malfunctioned, killing everybody’s cells, and precipitating the closure of the Dominion House laboratories and a wholesale move to Lincoln’s Inn Fields, much to everyone’s relief.) Experiments struggled on for a month or so, until Gerard suddenly realised that none of this made much sense—if even a proportion of these cells was able to cycle, how come there were always a lot fewer cells at the end of the experiments than there had been at the beginning? Up to this point, the cells had only ever been looked at under a conventional light microscope, where they could be counted, but where little else in the way of observation was possible. To see exactly how the cells were dying, something far more sophisticated was required. Fortunately for Gerard, it was available at the Lincoln’s Inn Fields laboratories: time-lapse cinemicroscopy. Cinemicroscopy was a very recent arrival at ICRF and, indeed, in the science world, coming into existence at roughly the same time as Gerard’s relocation to Dominion House. It revolutionised the way people could monitor cells growing in culture, by allowing them to watch the behaviour of individual cells over time, rather than just look at two time points, the start and the end of an experiment. It was the forerunner of today’s incredibly sophisticated time-lapse digitally recording microscopes, but was a very simple setup, consisting of a microscope, a flask full of cells, and an attached cinefilm camera. Every two min or so, the camera was rigged to wind on a frame and take another photo down the microscope. At the end of an experiment, the film was sent off to be developed. Upon its return, it could then be played backwards and forwards endlessly whilst the positions and fates of cells in the field of view were examined and mapped manually. Gerard made a date with Chris Gilbert, who ran the ICRF facility, and took along some of his cells to be filmed. What he saw changed the course of his scientific life forever: to his astonishment, none of the strange, rounded, floating cells were dividing. Instead, they were all dying, and they were dying spectacularly. Like a clip from a cellular horror movie, the cinefilm showed individual cells detaching from the culture dish and rounding up, then beginning to writhe and contort, their surfaces bubbling as though they had become molten lava, until finally and irrevocably, they exploded into tiny fragments. But what on earth was going on? This death looked very stylised, not like the raggedy, haphazard actions of a confused cell pooping out through mitotic bewilderment. Upon his return to Dominion House, Gerard bumped into Mike Owen, one of the other group leaders there, and got talking to him about the peculiar phenomenon he had just observed. Mike listened, looked at some of the photos, and realised that the cells’ behaviour looked strangely familiar. An immunologist, he had a long-term collaboration with an unrelated Owen, John, in Birmingham, who was developing methods for culturing the thymus, the organ from which the white blood cells called T cells originate, in tissue culture. John Owen had documented the appearance during his organ cultures of a large number of strange cells with very dense nuclei, which he had shown were dying by a process first documented almost 150 years previously and named apoptosis in 1972. Mike saw that Gerard’s cells, although they were fibroblasts, a completely different cell type from those in the organ cultures, were condensing and dying in a strikingly similar way. The immediate response of a scientist when faced with a new fact to research is to hit the library big time. Therefore, Gerard descended on the dusty stacks of the ICRF library and did some frantic self-education on apoptosis. What follows here is a brief summary of what he found. The process of apoptosis remained at the level of a mildly interesting phenomenon for many years after it was first noticed in 1842 by Carl Vogt, an inflammatory German scientist and politician more notorious for his subsequent theories on race and his potential role as a Bonapartist spy in Switzerland, than his work describing “natural cell death” in the tadpoles of midwife toads. The first detailed morphological description of apoptosis crops up in 1885, in the beautiful drawings of the eminent anatomist and father of mitosis research, Walther Flemming. Flemming’s drawings of “chromatolysis” show ovarian follicular cells shrinking, their nuclei fragmenting, and the formation of apoptotic bodies from their corpses. His discovery of what are still regarded as three of the hallmarks of apoptosis vanished into the ether for many years, together with the work of other 19th century anatomists who identified similar types of cell death, but were keener on studying cell division. In 1951, Alfred Glücksmann revived some interest with a comprehensive review article, in which he convincingly laid out the case for cell death being required for the sculpting of the body during neonatal development, the development of organs, and for metamorphosis in amphibia and insects. Richard Lockshin and John Saunders took this work further in the 1960s, when they realised that developmental cell death had to be tightly controlled, with a biochemical mechanism behind it, and a corresponding set of genes involved. Lockshin and his PhD supervisor Carroll Williams coined the phrase “programmed cell death” to reflect their view of the regulated nature of the process. Again, although embryologists now took on board the concept of death being a regulated part of development, this work did not penetrate the mainstream scientific consciousness. Although Kerr, Wyllie, and Currie had come up with a cracking name and also speculated on the importance of apoptosis in multiple processes, including cancer, their work attracted little interest, partly because there seemed no good way of nailing down exactly what mechanisms cells used to initiate and execute apoptosis; it still remained very much a process to be described, rather than understood. However, the advent of two key papers in two disparate fields, immunology and worm genetics, finally provided biochemical and genetic ways into the problem. For the biochemists, Andrew Wyllie published a paper in 1980 looking at the induction of apoptosis in thymocytes, the same cells that Mike Owen’s collaborator John Owen was studying. Wyllie showed that an enzyme called an “endonuclease,” which chops up DNA into small pieces, was needed for apoptosis to occur, and best of all, showed that one could monitor the activity of the endonuclease very easily, by looking on a size-fractionating gel for a ladder of DNA, where each of the rungs of the ladder were separated by exactly 146 bp. (The endonuclease cuts at gaps between nucleosomes, the structures onto which chromosomal DNA is wound, and each nucleosome accommodates 146 bp of DNA.) Nucleosome laddering gave scientists an assay for early apoptosis that was both easy and quick, rather than the laborious and unquantifiable pictures produced by the histopathologists and embryologists from cut-and-stained sections of tissues. On the genetics side of things, Bob Horvitz and John Sulston, working in Cambridge on tracking the developmental origins of every cell in the adult nematode worm Caenorhabditis elegans, realised that of the 1090 cells generated during development of an adult hermaphrodite worm, the same 131 cells always died, and moreover, they died by apoptosis. C. elegans is a geneticist’s dream because it grows rapidly and can be mutated easily, and Horvitz and Sulston’s discovery meant that it was now possible to start looking for mutant worms in which cells meant to die stayed alive, or vice versa. The underlying genetic mutations causing “undead” phenotypes would be in genes controlling and executing apoptosis, and these genes could be isolated, cloned, and their DNA sequences determined. The importance of this work was recognised when Horvitz, Sulston, and Sydney Brenner (whose foresight had driven the development of C. elegans as a model organism) won the 2002 Nobel Prize for their discoveries concerning the genetic regulation of organ development and programmed cell death. By the time Gerard had his momentous conversation with Mike Owen, a total of around 500 papers had been published about apoptosis and programmed cell death, mostly in the fields of developmental biology and immunology, with a few also looking at the behaviour of cancer cells. Many were still descriptive, but the most recent crop of papers was starting to identify genes involved in the death process and to try to put these in the context of overgrowth, as occurred in cancer. One of these genes, BCL2, caused Gerard’s scientific radar to start beeping madly because it was already very familiar to him, but in a different context: BCL2 had been suggested to be an oncogene. The BCL2 gene first cropped up as a candidate oncogene in 1984. Since then, it had been very resistant to attempts to prove it really caused cancer because it didn’t seem to work in any of the standard assays, such as causing cell overgrowth. However, in 1988, David Vaux, a postdoc in Suzanne Cory and Jerry Adams’s lab in Melbourne, convincingly showed that the BCL2 protein appeared to be a different sort of oncogenic animal, namely, an anti-apoptotic survival factor. It couldn’t force cells to cycle and make tumours that way (in fact, it arrested the cell cycle), but instead it allowed distressed cells to stay alive until they could be taken advantage of by a second, growth-promoting oncogenic mutation. In the Vaux paper, the second cooperating oncoprotein able to work with BCL2 was none other than … MYC. The story at this point might just have petered out into another publication in a worthy, second-rank journal, with some dutiful observations, albeit using a cute new technique, about the mechanism by which MYC caused the cell death that so many researchers in the field had already encountered. Indeed, the atmosphere in the burgeoning field of molecular biology at that time was exactly conducive to such an outcome. Almost all of those working on deciphering the ways in which proteins and genes functioned were basic researchers, doing bottom-up, technically challenging science, in many cases still at the dawn of knowledge in their particular fields, where feverish excitement could be generated merely by finding out how protein A might connect to protein B, and how A and B interacted with C. All was unknown, even at the lowest, nuts-and-bolts level. Furthermore, there was a deep and snobbish divide between such research and what in today’s parlance would be called translational research: Taking basic science observations and considering whether they would be useful in a clinical context was widely considered to be the easy option, for those who could not generate new ideas or data but spent their careers recycling the observations of others. These factors conspired to produce a culture in many labs of single-minded dedication to the problem at hand, with little thought for any potentially wider implications. Gerard, however, had an edge on many of his colleagues and competitors: He had trained in two places with world-famous reputations for omnivorous scientific reading and thinking. At the Laboratory of Molecular Biology in Cambridge, he had done a PhD in a clinically oriented lab, trying to find out whether the body’s immune system was able to detect and kill cancers. At the same time, he had been exposed to the sometimes frighteningly adversarial but intellectually invigorating atmosphere there, where the opinions of the lowliest PhD students were considered as valid as those of the most eminent Nobel laureates, as long as they were logical and thought-provoking. Secondly, Gerard’s postdoc supervisor, Mike Bishop, was and is one of the most perceptive thinkers in cancer biology, and, having originally trained as a medic, naturally viewed the study of the molecular biology of cancer as a means to an end—understanding cancer itself. An even more omnivorous reader than Gerard, Mike also introduced him to the writings of Stephen Jay Gould, and hence to evolutionary theory, converting Gerard to his view that all biological processes must be evolutionarily explicable and that, therefore, any theory that does not make evolutionary sense is unlikely to be the correct one. With his science brain configured in this slightly unusual way, Gerard made a conceptual leap that to him seemed blindingly obvious, linking his discovery that MYC could cause apoptosis to that of David Vaux showing that MYC could cooperate with BCL2. Death caused by MYC was a programmed part of the cell’s lifestyle, not a consequence of a mitotic car crash; an executed decision, not an accident. This meant that MYC was constituted to have dual, seemingly opposite functions, able to push cells into cycle, but also forcing them to die under certain circumstances. BCL2, on the other hand, actively stopped cells from cycling and protected them from death. Might not this mean that the whole idea of oncogene cooperation, originally proposed by Parada, Land, and Weinberg to be a simple alliance between one oncogene driving one aspect of tumour formation, such as too much cell cycling, and another oncogene driving a different aspect, such as stopping death, was far too simplistic? Better, surely, was a theory in which cooperating oncogenes not only had complementary cancer-causing functions but were able to override the other’s inbuilt safety mechanisms, delivering a far more potent double whammy to the normal cell? Normally, if a cell accidentally made too much BCL2 it wouldn’t matter because it wouldn’t be able to cycle, and if it made too much MYC, that wouldn’t matter either because it would just die. Only in a situation in which the two oncogenes were wrongly switched on together would MYC override BCL2’s cell cycle block, pushing cells to cycle, and BCL2 stop the apoptotic signals being sent by MYC from being executed, and only then would there be a possibility for a cancer to initiate. Gerard’s new idea had enormous implications for cancer biology as a whole. Since the discovery of the potency of individual oncogenes and their abilities to make cells transform into immortal, continually growing lines in culture, there had been puzzlement over why, if oncogenes were so powerful, people did not develop tumours all the time. After all, humans have around 100,000 billion cells in their bodies, so the chances of a cancer-causing mutation occurring are huge. Why should normal cellular proliferation be so easy but cancerous growth so hard? According to Gerard’s thinking, the answer was that pathways that drove growth were configured so that if one got activated out of context, there was a tumour-suppressor defence mechanism evolved into it. The decision for a cell to proliferate could be compared with releasing an elaborate combination lock: Under normal circumstances, the code for the lock would be figuratively provided by a set of growth signals activating a particular set of receptors on the cell’s surface. If the combination was correct, the lock would open, unlocking the proliferative capacity of the cell and putting it into cycle. If the signals were of the wrong sort, or in the wrong order, or were too strong, the code would be wrong and the lock would refuse to open. The radical difference between the lock analogy and what happens in the body is that rather than the lock just staying shut, any tampering with the mechanism results in it blowing up, destroying the cell in the process. The experiments for the paper Gerard and his coworkers eventually published in Cell on 14 January 1992 are simple and to the point. Evan et al.’s “Induction of Apoptosis in Fibroblasts by c-Myc Protein” contains eight figures, illustrating the key results. All of the data are from experiments performed in immortalised Rat-1 fibroblasts, a type of cell derived from connective tissue, and one of the workhorses of tissue culture. The first two figures in the paper show the original observations that the lab made, that when fibroblasts overexpressing MYC protein are starved of serum, they are forced to cycle repeatedly, in contrast to the control samples, which drop out of cycle. Despite the continual cycling, the MYC-expressing cells do not increase in number. Figure 3 is the core of the paper, showing that in the presence of MYC, the cells are dying by apoptosis. This is shown using stills from the cinemicroscopy films, a photo of a gel with the apoptotic nucleosome laddering pattern, and some very pretty electron micrographs showing individual cells at different stages of apoptosis. Figure 4 uses cells containing an artificially modified MYC protein that can be switched on and off by addition of the hormone estradiol to the cultures, and is there to show that apoptosis only happens when MYC is switched on, showing that MYC protein really is what is driving the apoptosis. Figure 5 answers the question of whether all of the data are simply a horrible tissue culture artefact only observable in one particular cell line, by showing that MYC is also able to induce apoptosis in serum-starved fibroblast cells taken directly out of an animal. Figure 6 looks at a set of cell lines with different amounts of MYC in them and shows that the number of cells dying in culture depends on how much MYC is around, with a complete correlation between more death and more Myc. Finally, Figures 7 and 8 show that MYC can induce apoptosis in any arrested fibroblast, irrespective of how the arrest was achieved, and, using the switchable MYC mutant inducible by estradiol, whether or not MYC was present when the arrest started. Finally, there is a table showing that the same parts of the MYC protein known to be important for its activity as an oncogene are also required for its ability to induce death. The simplicity of the experiments, and the carefully discussed conclusions, belie the frantic activity that had ensued following the first observations the lab had made. Almost the first step that Gerard took was to make an appointment to go and visit Andrew Wyllie, one of the fathers of apoptosis, who had moved from Aberdeen to be Professor of Experimental Pathology at Edinburgh University. Gerard’s initial conviction that he had stumbled onto something important was confirmed by Wyllie, who could see the enormous implications of apoptosis being a mainstream suicide mechanism rather than an occasional habit of white blood cells and developing embryos. Wyllie became a valued colleague, expert in the arcane lore of the apoptosis field, and was responsible for suggesting to Gerard that the work was so interesting that it should be submitted to Cell, for maximum visibility. Back in the lab, Trevor, Dave, and Cathy were working all hours doing endless tissue culture, sometimes staying all night. Everyone was excited because they all realised that, finally, after all of the awful things that had happened to the lab in the last few years, they had got their big break. If MYC causing apoptosis was as big a deal as they thought, they were set for stardom, or at least temporarily released from the fear of failure that haunts the hearts of all scientists. Others in Gerard’s circle of friends and collaborators had also realised how much this mattered, both to science and to Gerard’s prospects. Experiments were helped along by the continued collaboration with Hucky Land’s lab, and an awful lot of talking with anyone and everyone willing and interested enough to listen. The science grapevine was quickly alerted to the new work as people at conferences spread the word, and Gerard started to receive a trickle of invitations to give talks at meetings that quickly transformed into a flood. To begin with, many cancer biologists reacted with extreme scepticism to the idea that an oncogene, especially one so powerful as MYC, could be hard-wired to cause a cell to kill itself. Gerard recalls the first talk he ever gave about it, at a Gordon conference, traditionally a venue for the frank exchange of views and a very prestigious gig for an up-and-coming scientist. Leaving aside the several people who walked out, whether from disbelief or preferring the competing charms of an early coffee break, many prominent researchers in the field were reluctant to let go of the idea that this property of MYC’s was no more than a by-product of its forcing cells into cycle. The consensus view was that an individual cell was able to sense its health or otherwise, and if it detected that something bad was happening, such as excessive cycling, it would fall sick and die, by a theoretical mechanism snappily named “mitotic catastrophe.” Therefore, the phenomenon “Sick of MYC” was just that: a terminal illness, a set of conflicting signals whereby Myc said one thing to the cell, the rest of the cell thought something else, and the two viewpoints were irreconcilable. The problem with such anthropomorphic thinking was that, viewed from an evolutionary perspective, it made no sense. Firstly, the notion that an oncogene could have a main function, from which all its properties flowed, was nomenclature-based determinism, a belief that the first thing a gene was discovered to do had to be the most important. Just because MYC was first noticed in the context of excess cycling did not mean that that was the main thing it did. More importantly, evolutionary theory now held that the organism was the fundamental unit of evolution, with its genes just a vast collection of biological meccano that could be assembled into as many different networks as were needed for the body to function and survive; genes had a function, but that function could be used in a whole organism for multiple purposes. Viewed like that, it was perfectly reasonable for MYC to be involved in any number of processes and that these processes might dictate conflicting outcomes was irrelevant: The downstream readout was a function of the pathway as a whole, not its individual components. The second big obstacle to acceptance of Gerard’s work was that the idea that normal cells were programmed to commit suicide if tampered with, that they were humble foot soldiers killed off to protect the greater cause, was very much a novelty at the time. Cells were viewed as important nonexpendable entities, wired to stay alive and reproduce themselves at all costs; there was an almost emotional attachment in the field to the life of an individual cell. However, such sentimentality was not shared by the bodies of those subscribing to this view; while they grew in the womb, their cells had been killed with ruthless abandon, with apoptosis used as a developmental tool to sculpt the body, editing out, amongst other things, the embryonic webbing between their fingers and toes. What was true in development was also true in immunology, where vast swathes of immature cells died on their way to maturity, because to do otherwise opened up the possibility of autoimmune disease, when rogue cells start to destroy the body’s own tissues. Interestingly, MYC had already been implicated in apoptosis of immune cells, in a 1991 publication from John Cleveland’s lab at St. Jude Children’s Research Hospital in Memphis, Tennessee, and a second paper showing that loss of MYC could protect mature activating T cells from apoptosis appeared in 1992, from Doug Green’s lab in La Jolla, California. These papers were also greeted with some scepticism, but the general view was that because immune cells were “supposed” to kill themselves, it was less off the wall than Gerard’s work in fibroblasts, where apoptosis was almost completely undescribed. Other objections continued to do the rounds, one of the most persistent being that if apoptosis were so all-pervasive, why wasn’t it more obvious? As Gerard put it in a 1974 article, “Even a cursory inspection of your nearest colleagues will indicate that they comprise palpably living cells with … little evidence of substantial cell death” (Evan 1994). This point was cleared up once a harder look was taken—it turns out that the speed with which apoptosis happens and with which the debris is cleared up by other cells is simply so fast that it had been missed—but it hid an understandable and very human grievance on the same subject: All of Gerard’s really rather good colleagues in the MYC field were having to admit to themselves that in their obsession with MYC and the cell cycle, they had all failed to see the apoptotic elephant in the room, which was something of an assault to their collective scientific pride. Fortunately, all was (mostly) forgiven very quickly, once it became clear that Gerard really was on to something; the apoptosis bandwagon was rolling, and everyone wanted to hop on board. Science, like pop music, has its fair share of one-hit wonders; Gerard was well aware that if he didn’t capitalise on his discovery, he wouldn’t get another chance at success. Once his first observations were published, he knew that he would have to operate at a flat gallop if he wasn’t to be flattened in the stampede. He was simultaneously terrified that he’d mess up and elated that he’d finally found his métier. Proving that apoptosis had a central role in cancer, finding out how that role might be fulfilled, and using the knowledge gained to design anti-cancer therapies was about as intellectually satisfying a task as he could conceive of. He and his lab leapt into the fray, knowing that what was great about his big idea—that apoptosis was a programmed safety mechanism carried at the heart of all cells—was that it was eminently testable and experimentally very tractable. Matters started to move very quickly. Over the next few years, the Evan lab became a paper mill; as the lab filled with ambitious and hard-working postdocs and graduate students, lured by the promise of being in on the start of something, every experiment that they did seemed to work, and all of their papers got into highly respected, high-profile journals. 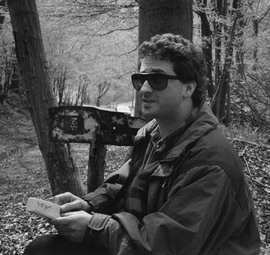 In the autumn of 1992, Gerard published a paper in Nature about oncogenic cooperation between MYC and BCL2. As he’d surmised, the two oncogenes were able to work together because they could compensate for each other’s weaknesses: BCL2 protected cells from MYC’s murderous tendencies, whereas MYC chivvied cells into cycle, overcoming BCL2’s cell cycle block. However, the paper was more than just a vindication of Gerard’s original thoughts; the Evan lab had been caught up, and their publication was back-to-back with another saying the same, from the lab that had shown the link between MYC and apoptosis in T cells—that of Doug Green in La Jolla. Events could have taken a very nasty turn, given the highly competitive nature of the subject, but fortunately for both labs, Doug and Gerard soon met, at a conference in the windswept wastes of the University of East Anglia campus. Doug, heading back into the conference hall following a quick trip to the lavatory, met Gerard heading out on the same mission (an awful lot of coffee is consumed at meetings). The two men realised pretty quickly that despite being competitors, they were so similar in temperament and outlook that they couldn’t help but be friends first. Happily, they’ve been best friends ever since: mutual repositories of scurrilous stories, enthusiastic occupants of numerous conference bars, and scientifically distinguished collaborators and competitors. The evidence for a central role for apoptosis continued to pile up rapidly. Other oncogenes and transcription factors, notably E2F and E1A, were shown by other labs to have the same dual nature as MYC, making commonplace what had once seemed revolutionary. Earl Ruley’s lab showed that RAS, another very unpleasant oncogene mutated in one in three of all human cancers, could induce replicative senescence, when cells exit the cell cycle but do not die, showing yet another control mechanism cells use to fight oncogenic changes. In 1994, in a paper in the EMBO Journal, the Evan lab proved the most important tenet of Gerard’s theory, that of MYC’s duality. In normal conditions, a cell exists within a network of social survival signals, which suppress MYC’s signals to the apoptotic programme but allow its proliferation signals to make it through, so that cells grow. If the survival signals are removed, MYC’s apoptotic signal is no longer suppressed and cells die. However, if the survival signals are maintained artificially, MYC cannot kill the cells but drives them into cycle, causing tumours. By the time this paper came out, however, the battle for acceptance was long won, and the field had settled down to the long slog of working out the exact mechanisms involved in triggering and then executing apoptosis. Today, we know an awful lot about apoptosis—mechanistically, it is probably one of the best understood cellular processes, thanks to the combination of biochemistry and genetics that proved so important in the genesis of the field and have continued to have a vital role. From an average of about 40 papers a year pre-1992, there are now close to 10,000 articles published about apoptosis annually, more than one every hour. However, despite roughly one in 50 of these publications having some mention of MYC in them, we are still not quite sure exactly how MYC works to cause apoptosis. What is known then? MYC is a transcription factor, implicated in switching on some 15% of all genes. It is ubiquitous, and as befits such a powerful protein, highly regulated, coming on only in response to growth signals. Just about every process in the cell appears to depend to some extent on MYC, and therefore, its power does not derive “from any specific subset of its functions, but through its unique capacity to coordinate and integrate the diverse gamut of processes that, operating together, underpin somatic cell expansion” (Soucek and Evan 2010). In other words, MYC is the cell’s puppet master. MYC is deregulated and overexpressed in nearly all tumours, and analysis of the genes it switches on (the “MYC signature”) gives some insight into its fearsome reputation as an oncogene; the MYC signature looks an awful lot like the transcriptional signature of a stem cell, making it very likely that MYC has a big role in the generation of cancer stem cells. These cells, which carry the cancer blueprint, are often able to survive anti-tumour therapies and are responsible for recurrence of disease. MYC’s ability to cause apoptosis is partially understood, because it can induce the p53 tumour-suppressor protein, causing cells to kill themselves. However, there are clearly MYC-driven apoptotic pathways independent of p53, about which we currently know very little. Rather than being a sole regulator of apoptosis, as it was in the artificially created tissue culture milieu of Gerard’s original experiments, in normal life MYC functions to sensitise cells to a huge range of pro-apoptotic insults, including starvation, oxygen deprivation, DNA damage, and the activation of death receptors—proteins able to transmit apoptotic signals coming from outside the cell. In this duality, it shares a common function with many proto-oncogenes, acting as a driver of proliferation, but also as a sentinel detecting unnatural changes to a cell, nearly always brought about by tumour-specific growth. Anti-cancer therapies aimed at reawakening a cancer cell’s lost ability to apoptose have been pursued with much energy over the past decade. A 2002 review, written for the inaugural issue of the journal Cancer Cell by Gerard and Doug Green (they concocted it over a shared Thanksgiving weekend, although thankfully, no traces of turkey-based thinking seeped into the final product), pitched the idea that cancers are built on a precarious platform of two mutations, one causing overgrowth and the other causing apoptosis suppression, and that if one or the other of these mutations were to be counteracted, the cancer would die. The hypothesis flows directly from the original insights gained from the interaction of MYC and BCL2, and to general excitement, it has, indeed, proved possible to topple a MYC-driven cancer by knocking out its founding MYC mutation. Gerard’s lab, the lab of his old mentor Mike Bishop, and that of another ex-Bishop postdoc, Dean Felsher, have engineered mice with a switchable MYC gene embedded in their genomes. When the mice are treated with the switch compound, MYC comes on, causing tumours, but these tumours regress rapidly as soon as MYC is switched off again. These experiments challenge the idea that the founding mutations of a cancer are almost irrelevant once the tumour has got going and suggest that finding out how exactly a tumour has come by its resistance to apoptosis, and correcting the causative mutation, could be the Achilles heel of cancer. Could cancer be a disease that has such a florid outcome that its fundamental simplicity is masked? This is not so outrageous because there is a strong analogy to bacterial infection; the multiplicity of vastly different illnesses caused by bacteria can all be cured by one drug class, the antibiotics, which attack the fundamental weakness of all bugs, their dependence on an intact cell wall. As with antibiotics, combinatorial therapy will be required to cure cancers, to ensure that resistant substrains are also killed, but the prospect of anti-apoptotic therapy for cancer is a very hopeful one at present. And what of Gerard? After all the years of striving to be successful and shaking off the traces of his Cambridge experience at the Ludwig Institute, he realised that, actually, it wasn’t that much fun being a world authority on something, because many people stopped arguing with him, assuming that he knew what he was on about. It was also no fun being part of the furniture of an institution, and so, after a very productive decade at the ICRF, Gerard left to go back to San Francisco, to the new UCSF Cancer Center, where he started again at the bottom of the heap, working on mouse models of cancer and driving a rather snazzy little red sports car across the Golden Gate Bridge to the lab every day. Having worked his way up to become a major player in both the MYC and p53 mouse worlds, he moved back across the Atlantic in 2009, to become Head of the Cambridge Department of Biochemistry and Sir William Dunn Professor. Gerard’s current research is focused on the processes responsible for the genesis and maintenance of cancers, in particular, cancers of the pancreas, colon, brain, skin, and liver. Understanding the molecular mechanisms that underlie the cell suicide machinery and how it can be manipulated therapeutically is still the overarching aim of his laboratory, and he continues to be one of the most productive and thought-provoking cancer biologists working today. For his work on apoptosis and cancer, Gerard was elected to the UK Academy of Medical Sciences in 1999 and became a fellow of the Royal Society in 2004. His 1992 Cell paper is an acknowledged classic, having been cited more than 2600 times, and remains the most highly cited research paper ever to have been published by scientists working at the London Research Institute. www.youtube.com/watch?v=G0D29CO2Lq4 Gerard talks about his research. www.youtube.com/watch?v=xdLPpdoU2Nc Video of cells undergoing apoptosis. Bishop JM. 2003. How to win the Nobel Prize. Harvard University Press. A wonderful autobiography by Gerard’s postdoctoral mentor Mike Bishop, the 1989 Nobel laureate in Physiology or Medicine. Green DR. 2011. Means to an end: Apoptosis and other cell death mechanisms. Cold Spring Harbor Laboratory Press, Cold Spring Harbor, NY. Technical but entertaining book by Gerard’s drinking partner Doug Green. There’s a companion website too: http://celldeathbook.wordpress.com. Evan GI. 1994. Old cells never die, they just apoptose. Trends Cell Biol 4: 191–192. Soucek L, Evan GI. 2010. The ups and downs of myc biology. Curr Opin Genet Dev 20: 91–107.